People go missing every day. Sometimes they walk out of their lives and sometimes they are taken against their will. After the police have done everything they can - and if the person still cannot be found - what then? Retired Detective Superintendent's Leonard Frank's daughter has perhaps more knowledge and resources than most but when she is warned off her investigating her father's mysterious disappearance by her superiors, she has no choice but to call in a specialist people-finder. David Raker is already known and disapproved of by most police officers he has met. He is an ex-journalist and therefore perhaps their suspicions of him are understandable but they also question some of his methods. Because, of course, he doesn't have to follow the same strict rules in his investigations as they do. So he is a bit suspicious when serving police officer Melanie Craw approaches him to help track down a missing person and very surprised when he learns that it is her father, Leonard Franks. Leonard and Ellie Franks lived in an isolated cottage on the moors in Dartmoor. Leonard went out to the woodpile to collect wood for the fire one winter afternoon and never came back. His disappearance, without clothes, money or telephone has everyone stumped - how was he spirited away from the house from which the moor stretches in full view for miles? Is the disappearance connected to an old case he worked, is it payback for a conviction and if he went willingly, why? As Raker investigates, he struggles with the reluctance of Frank's old colleagues to talk to him but gradually pieces fall into place and then he finds himself up against men who will do anything to keep their secrets, even threaten the very people closest to him. 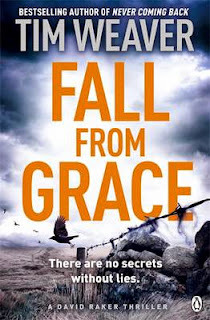 This is a really pacy thriller, the action packed into only a few days. The characters are very well written and engaging and I found myself understanding some of the actions of even the bad guys in the story. This is the fifth novel to feature the character David Raker but is easily read as a standalone. David Raker is new to me and I find myself wanting to read the other novels featuring him - this is an exciting read - a real find.